Free Shipping Included! 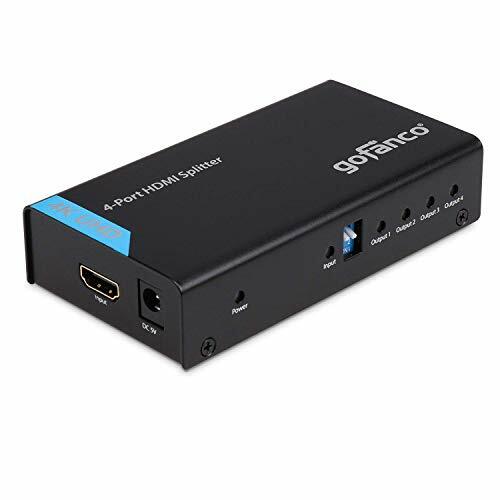 gofanco HDMI Splitter 4K 1X4 Port HDMI to HDMI Signal Distributor with 4 EDID Modes, Supports up to Ultra HD 4K @30Hz,3D, Compliant with HDMI and HDCP Standards, 1 in 4 Out (Splitter4P) by gofanco at Home Entertainment Centers Online. MPN: Splitter4P. Hurry! Limited time offer. Offer valid only while supplies last. gofanco 4-Port HDMI Splitter 4K splits and distributes identical HDMI video & audio from a single source to 4 HDMI displays simultaneously. gofanco 4-Port HDMI Splitter 4K splits and distributes identical HDMI video & audio from a single source to 4 HDMI displays simultaneously. > 1) MIXED EDID: uses EDID information from monitor with the lowest resolution and outputs to all connected monitors. > 2) COPY EDID: uses EDID information from monitor connected to Output 4 and outputs to all connected monitors. If there's no display connected to Output 4, all Outputs will display in 1080p. > 3) DEFAULT 1080p OUTPUT: 1080p resolution to all HDMI outputs. > 4) DEFAULT 4K OUPUT: 4K @30Hz resolution to all HDMI outputs. ✔ 4 FLEXIBLE EDID MODES - Mixed EDID, Copy EDID, Default 1080p output, Default 4K output. Please note: the default EDID mode of this product doesn't support 1080p at 10bit and 12bit colors. Please use "Copy EDID" option to support these color depths. Please refer to page 5 in our user's manual for different EDID modes. ✔ EASY INSTALLATION - No driver required; Sturdy metal enclosure provides durability and minimizes EMI/RFI noise interference. FCC, CE & RoHS compliant. We love our products and hope you will too. Our products are backed with a ONE YEAR limited warranty and experienced tech support team in Silicon Valley. If you have any questions or concerns regarding this product, please do not hesitate to contact us. If you have any questions about this product by gofanco, contact us by completing and submitting the form below. If you are looking for a specif part number, please include it with your message.